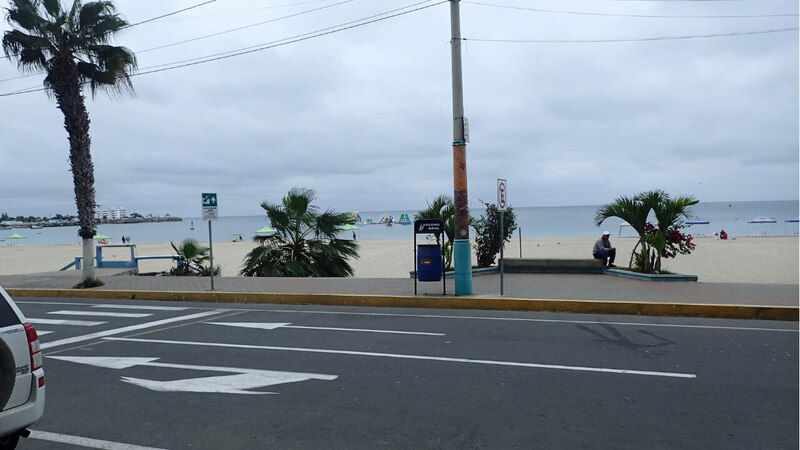 In 2013, I visited Ecuador during my personal search for an overseas home. After attending the Live and Invest Overseas Ecuador Conference in Guayaquil, my husband and I ventured inland, over the Andes Mountains, to Cuenca. Cuenca was (and is still today) the hot spot for expat living—approximately 6,000 expats residing in a town of 600,000 people. It proved to be everything we had heard and read about. But if you’ve been following my story in these weekly missives, you know we didn’t choose to live in Cuenca. Instead we chose Medellín, Colombia, mostly because we felt a greater connection to the cosmopolitan lifestyle Medellín offers. It was simply a hard-to-explain gut instinct. This is but one reason I recommend visiting any place you’re considering living before making a decision. Now, five years later, I think Ecuador deserves another look. 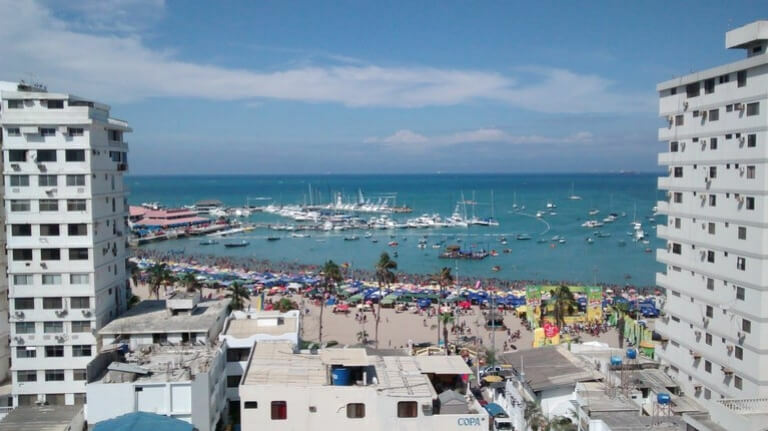 However, instead of revisiting Cuenca, I headed to the Pacific coast to check out the beach communities of Salinas, Ballenitas, Olón, and the little towns in between. For anyone dreaming about a beachfront retirement or second home, this area should be on your radar. Here the high season runs from December until April, so I visited in August to experience the off-season atmosphere and property opportunities. This time of year is also known as the “gray season” in some locations because the sky is usually hazy in the morning. However, the sun peeked out for a couple of hours each afternoon during my stay. The ocean-side towns were tranquil, the traffic was light, the beaches were nearly empty, and the vibe was laid-back. Several of the apartment towers I visited were occupied by just a handful of tenants. This means fewer residents at the private pools, or using the gym equipment, or in the sauna. I found an overall peaceful lifestyle compared to the high season when the noise level amps up and vacationers fill the town. A local real estate agent was kind enough to spend a couple of days with me to view a variety of properties. Whether you are looking for a place to live year-round or during your winter months, or if you’re considering an income-producing rental, you can find something to fit your needs in Salinas. I can’t share every property I saw, but here’s a quick sampling of four different options currently on offer. Spacious Apartment With Private Elevator Access: This 279-square-meter (3,000-square-foot), 10th-story apartment is one block from the beach, with gorgeous ocean and yacht club views. Built as a “Smart Building,” you need a security fob to enter both the building and the elevator. This allows the elevator to open directly into the units, all of which are one per story. This 4-bedroom, 4-bath home comes fully furnished and would make a great rental. With two balconies—one facing the bay on the north side and the other facing the south side of the Salinas peninsula—refreshing breezes sweep through and cool the apartment without need for air conditioning. You could expect rental income of US$2,000 to US$2,500 per month during high season and US$1,200 per month in low season. The list price for this 10-year-old apartment is US$279,900. 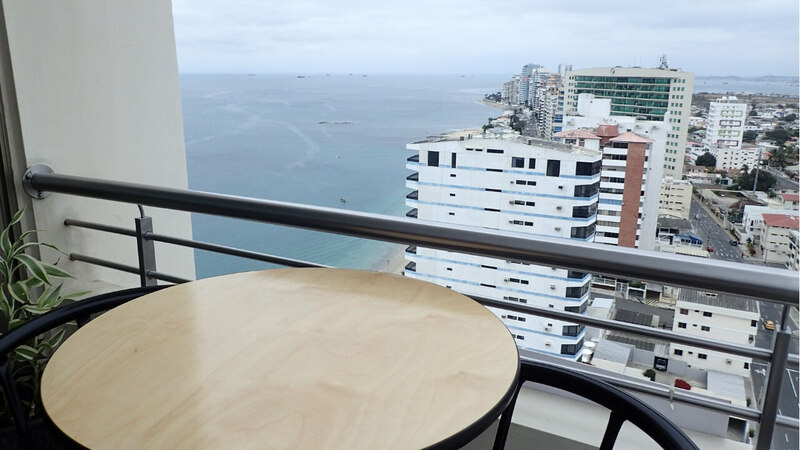 Compact Boardwalk Bargain: Located directly on the malecón, with easy access to the beach and viewing pier, this 18th-floor, 91-square-meter (980-square-foot), fully furnished apartment offers 2 bedrooms and 2 bathrooms. As this unit is on the back corner of the building, the spacious balcony looks directly toward the south side of the peninsula. But when you relax at the cute, two-person café table, you can enjoy the bay view as well. Designed with a clever use of space and all appliances included, this turnkey home is perfectly suited for the rental market. Your tenants will enjoy full use of the pool, gym, and concierge services in this 24-hour secured, 3-year old building. The price was recently marked down to only US$164,000. Chipipe Jewel In The Rough: Further out toward the point of the peninsula you’ll find the Chipipe neighborhood. 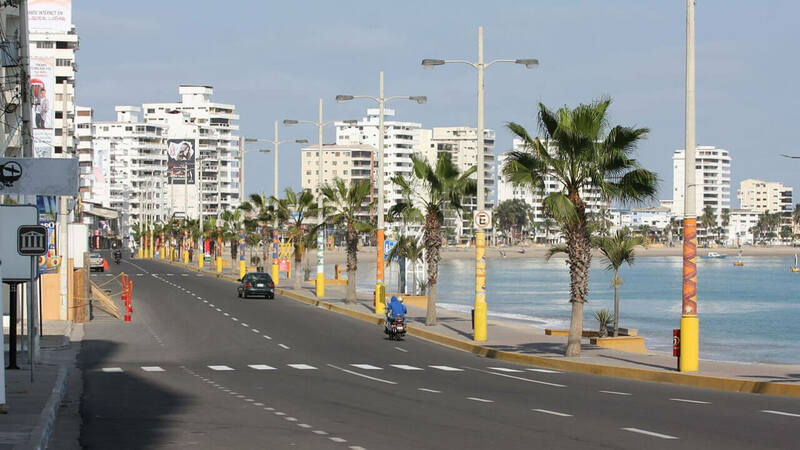 With an expansive beach and fewer shops and clubs, this area is quieter and more residential. The unit I visited was a 3-bedroom, 2.5-bathroom unit on the 14th floor of an older building, which means the rooms are larger with more architectural detail than the ultra-modern construction you’ll find in brand-new apartments. But it also means the apartment needs some updating, especially in the kitchen and baths. Because the cost of labor is low in Ecuador, you can expect to pay approximately US$5,000 for a brand-new kitchen, and a new bath will cost you around US$2,500. It boasts over 158 meters (1,700 square feet) and a spectacular view of the bay from the large balcony. The list price of US$240,000 means you’ll have money left over to upgrade this apartment to suit your style. Brand-New Luxury Chipipe Offering: Tower One of this two-tower project is complete and available for sale with five different floor plans to choose from. Listed at US$550,000, the apartment I toured was 200-square-meters (2,152-square-feet) with 4 bedrooms (2 with en suite bath) and an additional 1.5 social bathrooms. 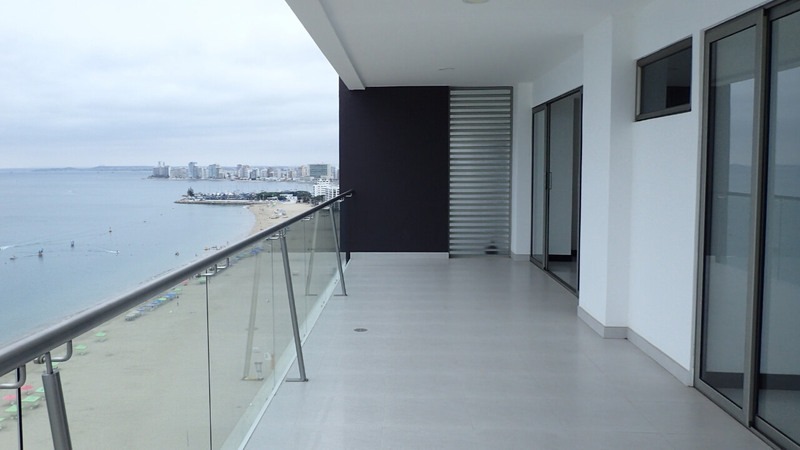 The 16th-floor, unfurnished apartment features a huge balcony with one of the best beach views I found anywhere in the Salinas area. Owners have access to two pools, a gym, a billiard and ping pong area, and an open social area. With Tower Two under construction as I write, you can lock in an apartment ranging from US$195,000 to US$365,000 with only US$10,000 down. As construction proceeds over the next 15 months, you pay 60% of the total cost of your unit, with a balloon payment at the end. The developer is expecting a 25% increase in the value of your investment upon project completion. I only mentioned four real estate opportunities in this letter, but I saw many more options with this energetic, professional, and licensed real estate agent. She’s a transplanted New Yorker who has lived in the Salinas area for more than 10 years, so she knows everyone and everyone knows her. Watch for future Ecuador reports as we keep our finger on the pulse of this exciting market.